While voice recognition technology already exists on other mobile platforms such as Android, only Siri is integrated into the iPhone’s operating system (iOS). 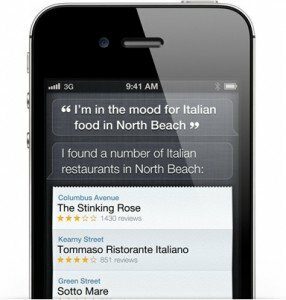 SIRI makes recommendations, answers questions and performs actions across multiple apps. With a single voice command or quesiton, Siri can give you the local weather, reminders from your calendar and most importantly for local businesses – search Google Maps, Bing & Yahoo local. By simply asking SIRI a question such as “Sushi restaurants near me,” Siri calculates your current location and then performs a local search of sushi restaurants nearby. It leverages the Google Maps/Places database of bricks and mortar local listings, then goes a step further by also searching things such as reviews within OpenTable, Yelp, CitySearch, ReserveTravel and more. It is paramount to understand that searches conducted from a mobile device are location specific – down to meters, looking for directions, finding nearby restaurants, or local services such as finding a painter, plumber or electrician. With Siri, and other voice searches the importance now becomes less about a visit to your website and more about enabling an easy way to contact you via click to call or a mobile website. MarketYourCorp.com will optimize your company content across the most important internet sites with keyword rich copy, alt tagged images (Siri checks for image data that will allow it to create a more positive visual experience), coupons and more to help you leverage your local business. Call or Click to Contact Us Today for your FREE consultation. I guarantee I can increase your presence to the high income iPhone and Android users in your local market area – Matthew Harris, Owner MYC.